Preheat oven to 375°F. 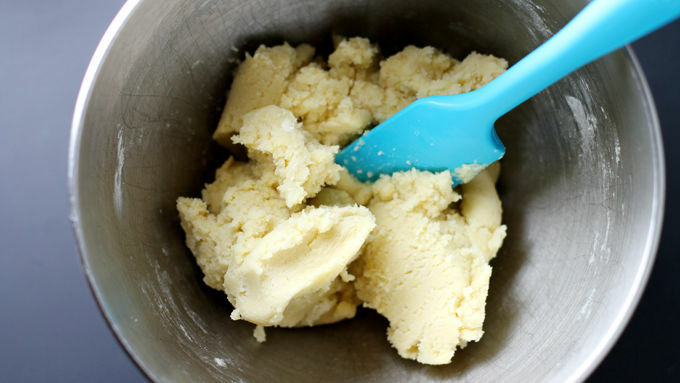 In a large bowl, stir cookie mix, flour, butter and egg just until a dough forms. Scoop and roll dough into 36 (1-inch) balls; space about 2 inches apart on ungreased cookie sheets. 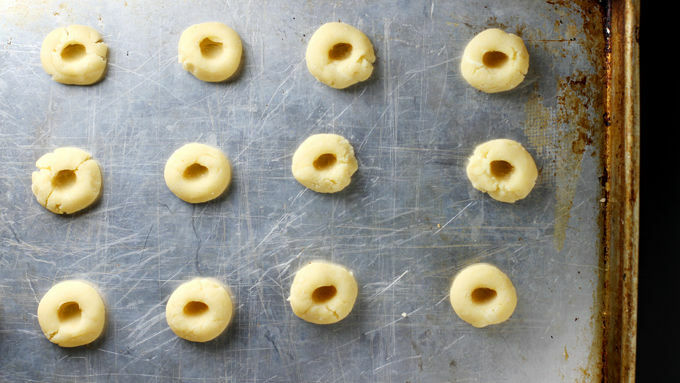 Using thumb or forefinger, make a deep indent in the center of each cookie. You want the indent to be as deep as possible without making a hole in the bottom of the cookie. Transfer baking sheets to fridge for 20 minutes or freezer for 10 minutes to firm up dough. Bake cookies 8 to 10 minutes until nearly done. 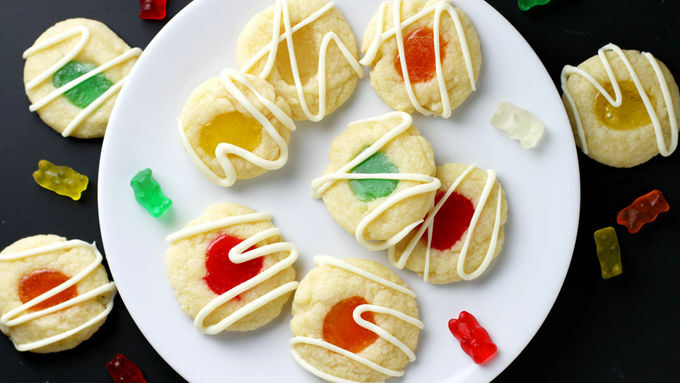 Lightly press 1 gummy bear candy into the indent of each cookie, then bake cookies another 2 minutes until gummy bear is fully melted and cookie is set. Cool cookies 3 minutes on cookie sheets, then transfer to a cooling rack to cool completely. In a small bowl, heat white chocolate chips in microwave on high for 1 minute; stir, then heat in 15-second intervals, stirring after each, just until chips are melted and smooth. Transfer mixture to a resealable plastic bag and snip off one edge. Drizzle white chocolate over fully cooled cookies. Allow icing to set completely before serving. After drizzling white chocolate, sprinkle cookies with sprinkles or colored sugar for extra pizzazz. Recipe adapted from The Baking Robot. 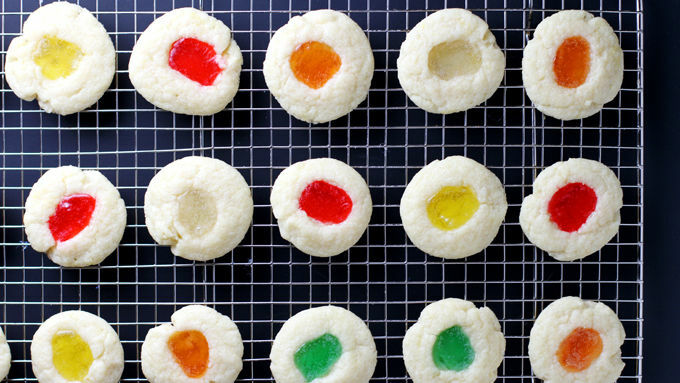 I have four words for you: Gummy bear thumbprint cookies. With a white chocolate drizzle. Okay, so that’s more than four words, but there’s so much to say about these yummy treats that I just can’t contain myself. You see, when I happened upon the original recipe from The Baking Robot, I just knew I had to make these cookies ASAP. So I bookmarked it… and then forgot about them. It wasn’t until weeks later when I waltzed by a bag of gummy bears at the store (as we do) and suddenly remembered the cookies. “Eureka!” I exclaimed, mid-waltz. In the middle of the aisle. It was weird. But I digress. I immediately grabbed the ingredients needed for the recipe (which is, like, a Betty Crocker sugar cookie pouch, some flour, butter, an egg, gummy bears and white chocolate chips and THAT’S IT) and raced home to make them. 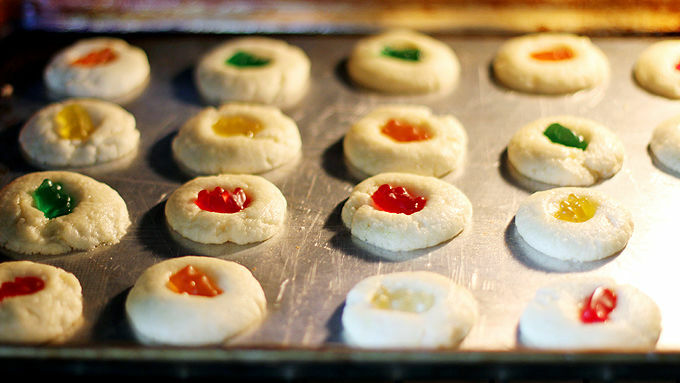 In less than an hour, I was in full-on gummy bear thumbprint cookie bliss. Also known as a cookie coma, because that’s what happens when you eat a dozen of them in one sitting. WORTH IT. A word of advice, do not skip freezing the cookies before baking. Freezing helps the dough to firm up a bit. This helps the cookies keep their shape as much as possible in the oven, including the indent, so don’t skip this vital step! Add some sprinkles or colored sugar, too, if you want, for added pizzazz. Store cookies in an airtight container at room temperature up to 1 week. Get ready to enter full-on gummy bear thumbprint cookie bliss/cookie coma mode!